Armed with two 'clean chits' from top authorities, BJP feels it has enough ammunition to slam Congress for 'personal attacks' against PM Modi. New Delhi: The Comptroller and Auditor General’s report on the Rafale deal is being seen as “yet another vindication” by the ruling Bharatiya Janata Party (BJP), which now plans to “talk extensively” about the report, as well as the Supreme Court’s earlier refusal to order a probe into the deal, in order to push its narrative of being “baselessly” targeted by the Congress. The CAG report, tabled in Parliament Wednesday, said the Rafale deal signed by the Narendra Modi government was 2.8 per cent cheaper than what the Congress-led UPA government had been negotiating. “This is yet another vindication. Our plan now is to talk extensively about what both the SC and CAG have said, and tell the voter how baseless and malicious the Congress allegations are,” said a highly-placed source in the BJP who did not wish to be identified. The Congress, led by its president Rahul Gandhi, has been consistently and aggressively attacking the BJP on the Rafale deal, even calling Modi a “thief”. The report also comes at a time when fresh revelations on the deal reported by The Hindu further bolstered the opposition’s claims and raised questions about the government’s actions. The Supreme Court, in December 2018, had dismissed pleas to probe the deal, saying “there was no occasion to doubt the process”. Armed with two ‘clean chits’ from two top authorities, the BJP feels it has enough ammunition to slam the Congress for targeting it, and for the “personal attacks against the PM”. “We believe the personal nature of the Congress’ attack on the PM, who is a popular leader with a clean image, would end up hurting it, especially given the Gandhi family has been associated with defence-related corruption in the past,” said another BJP leader on the condition of anonymity. Finance Minister Arun Jaitley’s remarks minutes after the CAG report was tabled echoed the same sentiment. “The lies of ‘Mahajhootbandhan’ (a grand alliance of lies) stand exposed by the CAG Report,” Jaitley tweeted, referring to the ‘mahagathbandhan’ (grand alliance) opposition parties are trying to cobble together. “It cannot be that the Supreme Court is wrong, the CAG is wrong and only the dynast is right. Satyameva Jayate – the truth shall prevail. The CAG Report on Rafale reaffirms the dictum,” he added as a jibe at Gandhi without naming him. 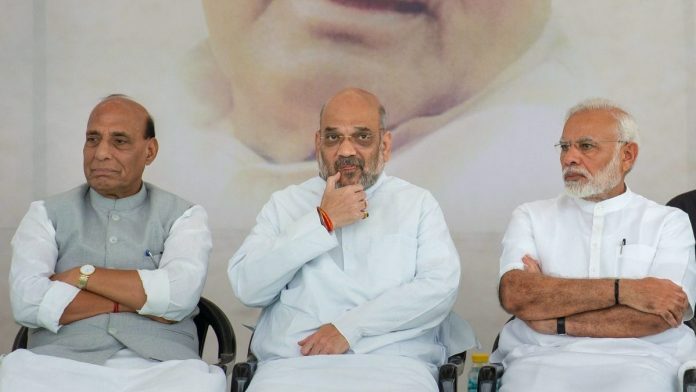 The BJP believes the various reports in The Hindu in the last few days allowed the opposition to hijack the narrative on Rafale, pushing the BJP into a corner, but the CAG report can help it “reclaim the narrative and claim innocence”, sources in the party said. The BJP has tried to portray Gandhi’s attacks on Modi as an ‘entitled dynast’ targeting a ‘self-made’ PM. Sources in the party say the CAG report — which came just as the poll season is beginning — will help add to the narrative of a “clean PM whose integrity cannot be questioned”. Modi and his party have been trying hard to convert the Lok Sabha polls into a ‘Modi versus others’ battle, portraying the PM as a victim whom rival parties are coming together to target. The party feels that the CAG report not just blunts the Congress attack, but also makes Gandhi’s constant refrain of ‘chowkidaar chor hai‘ seem even more of a personal war against Modi. On the campaign trail, it is often about emotion and perception. However, in TV debates, facts and figures will be important. Party spokespersons should be given concise legal briefs, dealing with each issue / facet that is in contention. Price, ISEs, delivery schedule, sovereign / bank guarantee, integrity pact, offsets. There are gifted lawyers on both sides who will wave away the confetti.